You may think installing a dishwasher is a major job. I have good news. It's not too bad, quite easy in fact for the moderately handyperson. The first thing to make absolutely sure of is that your new dishwasher will fit in your kitchen. 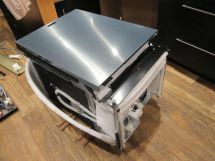 The standard dishwasher width is 24" and around 34" high (standard countertop height). Dry fit the new unit before starting the dishwasher installation. Kitchens pretty much always have standard cabinet widths so if you are wanting to install a dishwasher in a kitchen that has never had a dishwasher, you could most likely remove a 24" wide cabinet and carry on with installing a dishwasher. 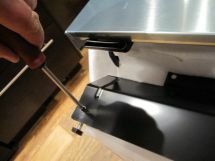 If you are replacing a dishwasher, some of the steps will not apply but pay attention to the water and drain hook-up as well as the electrical connections. Alright, let's begin installing a dishwasher. Gather up this list of materials and then we can start. Go ahead, I'll still be here when you get back. 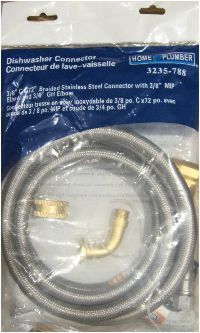 - Includes 90deg brass fitting, dishwasher hose connection, 1 1/2" ABS "Y" and usually some teflon tape. Step 2 - Dishwasher already roughed in? You will need to look under the kitchen sink, is it roughed in for a dishwasher? If you are not sure whether your dishwasher has a rough in, open the cupboard under your sink. 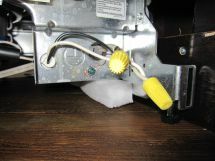 A roughed in for a dishwasher would have electrical run to the area as well as a water supply ( T-Valve or additional valve on hot water supply ) and the dishwasher "Y" ABS pipe installed before the P-Trap. If it is roughed in, you can go to step 4. If not, Step 3 for you. Your dishwasher will need hot water. 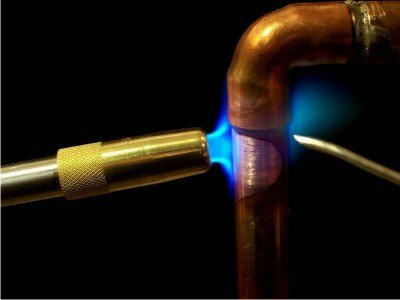 The easiest way to get hot water is to install a new valve under the kitchen sink. This valve should have two outlets, one for your sink and one for the dishwasher. The dishwasher will also need to drain. 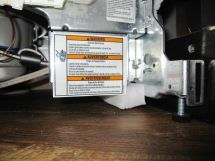 Install the ABS adapter with a dishwasher drain connection under your sink as well. Be sure that you install it before the trap, not after. You do not want any sewer gases coming in through the drain line. Phew! Who knew installing a dishwasher would be this easy? Lay the dishwasher on its back, carefully. Unscrew the kick plate. Put the screws in a place you will remember, nothing worse than loosing them - been there, done that. 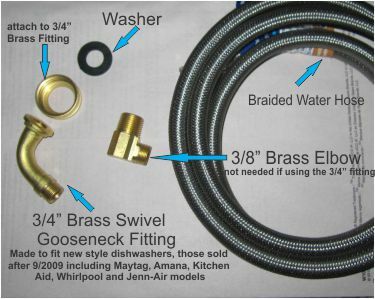 In the dishwasher installation kit you will find a small brass 90 deg fitting. Wrap teflon tape around the threads and screw it in the water inlet hole on the bottom of the dishwasher. Aim the end so the connecting hose will flow freely in the direction you so desire. The kit will also contain a braided hose. 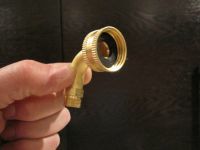 Attach this hose to the water supply fitting. TIP - Every dishwasher has front-to-back paths for hoses and wiring. Knowing where these are will help tremendously when learning how to install a dishwasher. 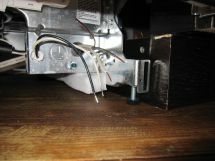 Attach the supplied dishwasher drain connection hose to the underside of the dishwasher. 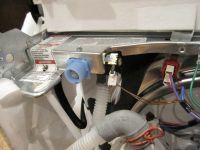 It is usually attached with a hose clamp but I have seen a spring clamp being used as well when installing a dishwasher. Make sure everything is tight to avoid any future dishwasher drainage problems. 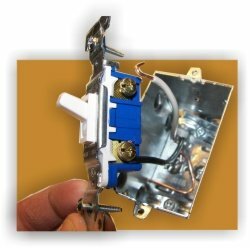 Run an electrical wire to the dishwasher. 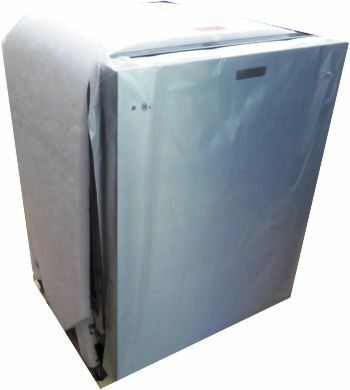 My experience on how to install a dishwasher is to use BX wire (the armour plated wire) because there is less chance of it being damaged or crushed. Don't hook up the electricity just yet. Using the proper wire connectors, connect the wires together. Make double sure there is no power to that line! 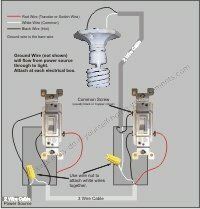 Black to Black, White to White, Ground (bare wire) to grounding screw (or green wire). Finish off the dishwasher plumbing. 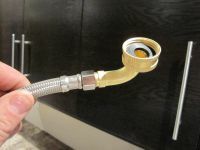 Attach the dishwasher drain connection to the sink drain and water supply line to the water pipe under the sink. The drain hose will need a "high loop". 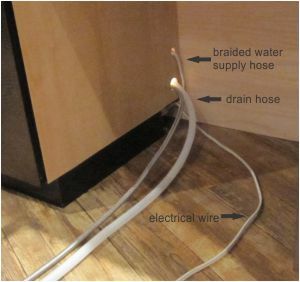 This is simply attaching the drain hose as high as possible under the sink so it goes up from the hole in the cabinet and back down to the drain. You are so close to installing a dishwasher, only a few more steps. Open the dishwasher door. Place a level under the top lip of the diswasher and adjust the legs so that the dishwasher sits level. Screw the dishwasher to the countertop with the supplied screws. 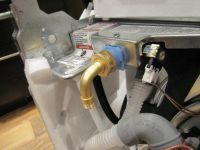 SIDEBAR: I did not put the high loop ( dishwasher drain air gap ) on my first dishwasher installation and that gave me a stinky dishwasher drainage problem! I couldn't figure it out for the longest time. The high loop keeps the hose dry and therefore, no smell. Turn on the water. Nothing spraying in your face? Great! Turn on the power. No sparks? Great! Do a test run and check the dishwasher drain connection. No Leaks? Great! Attach the kick plate and, voila! You are now an expert on how to install a dishwasher.